I’ve been meaning to tell you about my love for anything involving beans. 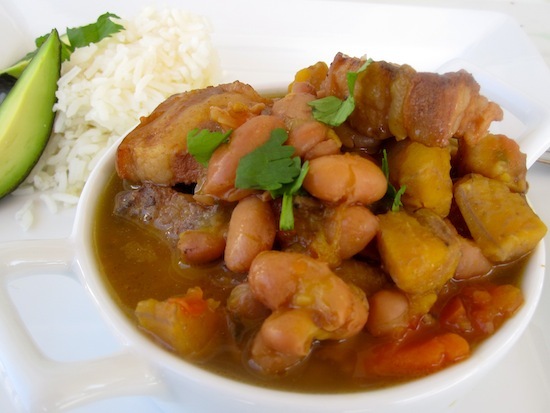 Actually maybe I have told you that before 😉 Anyway, growing up, my mother prepared Frijoles con Chicharron (Bean Stew with Pork Belly) once a week, which made my siblings and I very happy. Happy because it was food that involved beans and happy because it was deliciously rich and comforting and always cooked to perfection. She served them with white rice and avocado on the side. Simple and wonderful in every way. 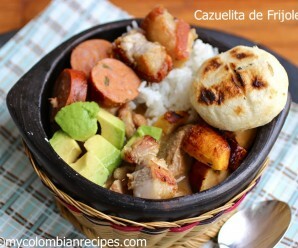 This dish is also popular in the Andean zone of Colombia. Sometimes I like to serve this stew as a casual weekday meal, just as we used to eat it at home when I was a girl. And at other times, I prefer to serve it as part of the Bandeja Paisa. Add the pork belly, stir and cook for 2 minutes more. Add the beans, carrots, cumin, color and water. Bring to a boil. Then cover the pot and reduce the heat to medium- low and cook for about 1 hour. Add the plantains and cook for 45 minutes to 1 hour or until the beans are cooked. (Add additional water, as necessary. )Add salt and pepper, stir and serve. A delicious meal and looks like a Chinese dish. They make something very similar in Portugal and yours sounds just as delicious. Do you think if I omit the plantain it would still turn out just as good? Its a hard vegetable to come by in Italy you see. Ruth- You can use potatoes. 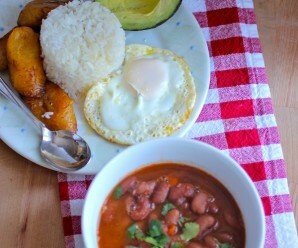 This looks so delicious, love white rice and avocado with beans, so this is a perfect recipe for me, can’t wait to make this! i share your love for beans, erica. i try to find some way to consume them at every meal. this is an awesome stew–easy on the eyes and tastebuds, no doubt! Que plato de cuchara más rico! Lots of good things going into that pot. Such a fabulous stew. I love all those big bean. Would be awesome with rice. I like it. I’ve been enjoying beans lately! This is a great recipe for me! So healthy and flavorful! This stew looks like it would definitely satisfy my bean cravings. I absolutely adore beans as well..and when you pair them with pork belly…you’ve got two of my favorite protein sources out there in one dish! This definitely looks like comfort food to me! It is a great dish. Love beans and pork. Your food always brings me such comfort. I love everything you make! What a healthy, delicioius stew! I love the plantian and carrots in it for a little sweetness! This is a lovely and comforting meal! It is the first time I see plantains not fried, just added to a stew; good to know. Nice to see someone out there likes pinto beans (as I grew up on them, so my favs)! 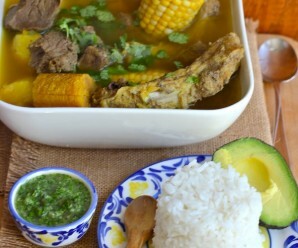 I just ate something like this last night, but with potatoes and pintos, and a Mexican brisket I make! I make mine soupy too, love it! Yours makes me wish I had another serving, so I will have to try a pork version! WHAT’S PORK BELLY? WHAT OTHER NAME THIS MEAT HAS IN THE SUPERMARKET? IN MEXICO WE USE BACON OR REAL CHICARRONES, PORK SKIN. Maria- Pork belly is pork skin with meat( Non smoke bacon “Tocino”). I hope this helps. This dish was fantastic. I made it on friday for my family and we loved it. 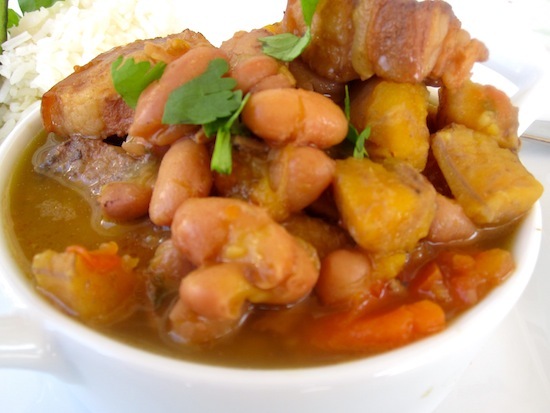 Erica, i am from Colombia live in Alaska i try the chicharron c=with beans last monday and was juist out of this world, thanks for your recipies, living so far from home your recipies help me feel like i am there. My fiancee just had this at a restaurant in Queens, NY and it reminded him of his Colombia…Thanks for the recipe I will try to recreate it. I’m from Colombia also and I have to say I could never make the frijoles con garra before I found your website … My son absolutely loved them … He is a fan of beans and I told him yesterday I will try again to make them with your recipe … My son is 10 years old and after he ate them he was so excited because I showed him your website and he want me to make all your recipes … Your recipe is awesome the beans tasted so good … Thank you for sharing Erika and I’m looking forward to try another recipes . 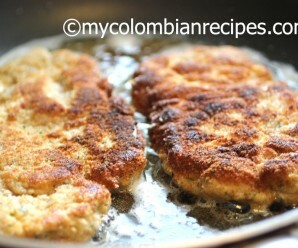 How do you cook the pork belly so it comes out crispy like Colombian chicharron ? Same with pernil. I’m able to cook a delicious pernil but always fail to have a crispy skin. Thank you!